Need evidence that there is justice in this world? 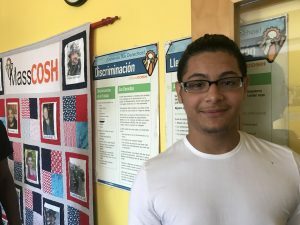 Ramirez’ enhanced respect for his teachers has its source in a summer program, Teens Lead at Work, known as TL@W, run by the Massachusetts Coalition for Occupational Safety and Health (MassCOSH). During the school year and throughout the summer, students train as peer leaders. They learn about safety on the job, violence de-escalation, sexual harassment and political advocacy for young worker safety. Then, they turn around and train their fellow high school students on what they’ve learned. These days, MassCOSH has TL@W down to a science, with some teens even elected to MassCOSH’s board. But what the boisterous teens, laughing in MassCOSH’s tight second-floor headquarters in Boston’s gentrifying Dorchester neighborhood don’t know, is that their participation was part of a carefully developed strategy to ensure MassCOSH’s relevance and survival into this century. Founded in 1976, MassCOSH was faltering by 1999, when former director Marcy Goldstein-Gelb took over the organization’s leadership. The board and Goldstein-Gelb went through a rigorous period of self-analysis and decided to narrow MassCOSH’s focus. “How could we fill a niche in areas that no one else is addressing and where workers are the most vulnerable?” was the question we asked ourselves, Goldstein-Gelb said. They settled on assisting Boston’s most vulnerable workers — immigrants, day laborers and temp workers, and also on helping teen workers. That was then. 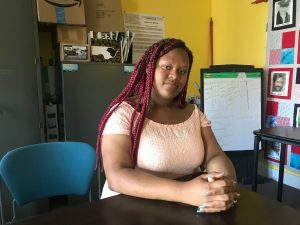 This month, on a steamy summer Thursday in Boston, Ramirez and a dozen other teenagers walked in the heat to the Boston School District’s resource center to meet with Katherine Walsh. Walsh is the district’s sustainability director in charge of efforts at 125 schools. “MassCOSH is one of our most vital and appreciated partners around healthy schools,” Walsh told them, before asking them what they saw as important in a healthy school environment. Well educated because of TL@W, they responded with healthy food choices, clean bathrooms, good air and water quality, trees and outdoor space, clean energy, and non-toxic cleaning chemicals. For the safety of staff and students, the school district, she said, is developing a zero waste policy for sustainability and health reasons. “Food waste is our biggest source of waste in the public schools,” she said. The students suggested solutions, including serving food the students actually like, so they don’t discard as much of their school lunches, and setting up share tables where unwanted food could be consumed by others. Composting would be another solution. Clutter is another problem. “We encourage schools to declutter,” she said. “Pests love clutter, so if you get rid of clutter, you leave less room for pests,” including mice, rats and cockroaches. The district provides a list of places to dispose of used books, electronic equipment and furniture. Later that afternoon, MassCOSH’s Al Vega, who was shepherding the teens, to a City Council hearing on “money that would come to repair school district buildings,” he said. Vega’s advocacy career began in the historic preservation of immigrant experiences and neighborhood development, leading tours of neighborhoods from an immigrant and public policy perspective. His community connections made him a good fit at MassCOSH, although he was new to its mission. Indeed, an earlier group of MassCOSH’s teens had played a role in upgrading Massachusetts’ child labor law in 2007. Again, it starts with knowledge, knowledge that may run counter to the natural instincts of young people. “They want to succeed, they are ambitious and they have a drive,” Sugerman-Brozan said. So, that makes them particularly attracted to work in the gig economy, where safety nets are nearly non-existent. What protections there are have been hard-won, with MassCOSH being a chief advocate for the Temporary Workers Right to Know law that went into effect on Jan. 31, 2013. The law requires staffing agencies to give workers clear pay and safety information. That doesn’t mean that tragedies don’t happen. On Nov. 3, Antawani Wright Davis, 19, was on his bicycle, between food deliveries for DoorDash, when a dump truck backed up over him, crushing him. A participant in the gig economy, Wright-Davis was considered an independent contractor, so OSHA didn’t investigate his death. “He happened to be a classmate and friend of some of our teens,” Sugerman-Brozan said, so TL@W training had particular significance. “The gig economy is like temp work. You are a classified as an independent contractor. You forego all benefits. Antawani’s family couldn’t get benefits, so we are beginning to work with young people about a campaign” on the safety of workers in the gig economy. In the meantime, the students at TL@W are becoming more aware of conditions on the job and at school. “I’m noticing how dirty everything is,” Ramirez said. Now, in school, he’s looking at the cleaning supplies the janitors use, trying to make sure there are “green” labels on the containers. Kahnari White, 17, believes that he and his fellow TL@W participants are best equipped to reach out to young workers for training and for advocacy. “They listen to us because it’s youth telling them,” he said. About the Author: Prizewinning journalist Jane M. Von Bergen covered worker safety as part of her 20-plus years writing about labor, employment and the economy during her 35 year career at the Philadelphia Inquirer and Philly.com. Von Bergen worked at smaller daily and weekly newspapers before joining the Philadelphia Inquirer in 1982. A lifelong reporter, Von Bergen began her newspaper career at age 10, serving on newspapers in grade school, junior and senior high school, and in college, where she was editor-in-chief of Temple University’s student daily paper and where met her future husband. She married her college sweetheart, photographer I. George Bilyk. They have two sons and live in Philadelphia.